field, and by students who might make use of these papers as models for future or current work. 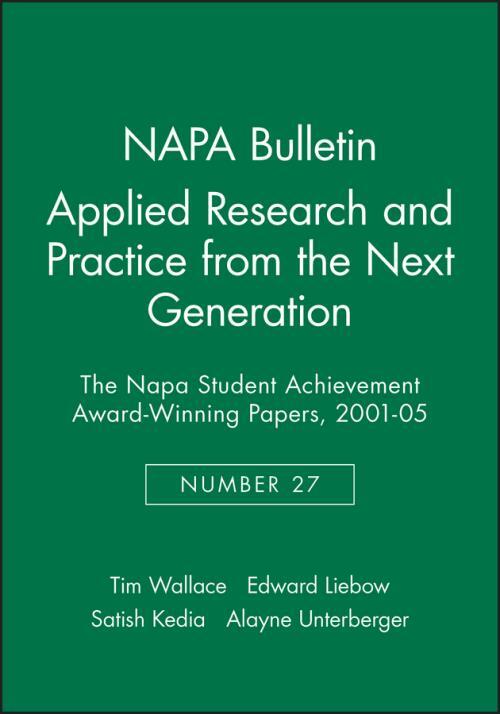 Celebrating Student Achievement: Award–Winning Papers 2001 05 Alayne Unterberger National Association for the Practice of Anthropology Bulletin May 2007, Vol. 27, No. 1: 1 6. How Visitors Experience the Edward James Olmos Americanos Exhibit: An Ethnographic Study Jennifer Gilroy Hunsecker , Jayne B. Hoffman , Elena O′Curry , Christina Wasson National Association for the Practice of Anthropology Bulletin May 2007, Vol. 27, No. 1: 7 26. The Philani Experience: Gender Equality and Empowerment of Women in South Africa Alexandra Kenny , Conny Camenzind National Association for the Practice of Anthropology Bulletin May 2007, Vol. 27, No. 1: 27 39. Engaging Ethnography: Student Engagement as a Means for Creating Change Wendy Hathaway , James Kuzin National Association for the Practice of Anthropology Bulletin May 2007, Vol. 27, No. 1: 40 63. A Foreign Concern : Solid Waste Management in Panajachel, Lake Atitl´n, Guatemala Anna Wex National Association for the Practice of Anthropology Bulletin May 2007, Vol. 27, No. 1: 64 80. The Ethnographic Evaluation of Michigan′s High–Risk Hepatitis B Vaccination Program Inez F. Adams National Association for the Practice of Anthropology Bulletin May 2007, Vol. 27, No. 1: 81 92. Health Change in Patients Using Alternative Medical Systems In Cuenca, Ecuador Michelle Albus National Association for the Practice of Anthropology Bulletin May 2007, Vol. 27, No. 1: 93 109. Development Agents And Nomadic Agency : Four Perspectives in the Development "Market" Karen Marie Greenough National Association for the Practice of Anthropology Bulletin May 2007, Vol. 27, No. 1: 110 128. An Analysis of the Impact of Aids on Funeral Culture in Malawi Adam D. Ki National Association for the Practice of Anthropology Bulletin May 2007, Vol. 27, No. 1: 129 140. Midwestern Museums and Classical Archaeology, 1893 1998 S. J. Redman National Association for the Practice of Anthropology Bulletin May 2007, Vol. 27, No. 1: 141 159. Government and Community Relations an Defforts for Comanagement in Macizo De La Muerte, Costa Rica Maggie Messerschmidt National Association for the Practice of Anthropology Bulletin May 2007, Vol. 27, No. 1: 160 175. "Is It The Spirit or The Body? ": Syncretism of Health Beliefs Among Hmong Immigrants to Alaska Jacob R. Hickman National Association for the Practice of Anthropology Bulletin May 2007, Vol. 27, No. 1: 176 195. Anthropology and Development Jason Jacques Paiement National Association for the Practice of Anthropology Bulletin May 2007, Vol. 27, No. 1: 196 223. Community Knowledge and at Titudes Toward Refugees and Asylees in Miami–Dade and Broward Counties: An Analys is for the International Rescue Committee Emily Eisenhauer , Alejandro Angee , Brianne Barclay , Jasney Cogua–Lopez National Association for the Practice of Anthropology Bulletin May 2007, Vol. 27, No. 1: 224 236. Biosketches of Authors National Association for the Practice of Anthropology Bulletin May 2007, Vol. 27, No. 1: 237 241.